Another lovely Chelsea Winter recipe. Light and tasty, a nice change from meaty bolognese. This pumpkin and chicken lasagne is made a bit more special today using fresh homemade pasta that Miss 14 helped to make. Being pasta making novices, we were inspired to try making our own, knowing there was a thermomix guided fresh pasta recipe that would probably be easy and also seeing pasta machines were 50% off at Stevens. I bought the masterchef one for NZ $60 which seemed like a bargain and was super excited to try this out. 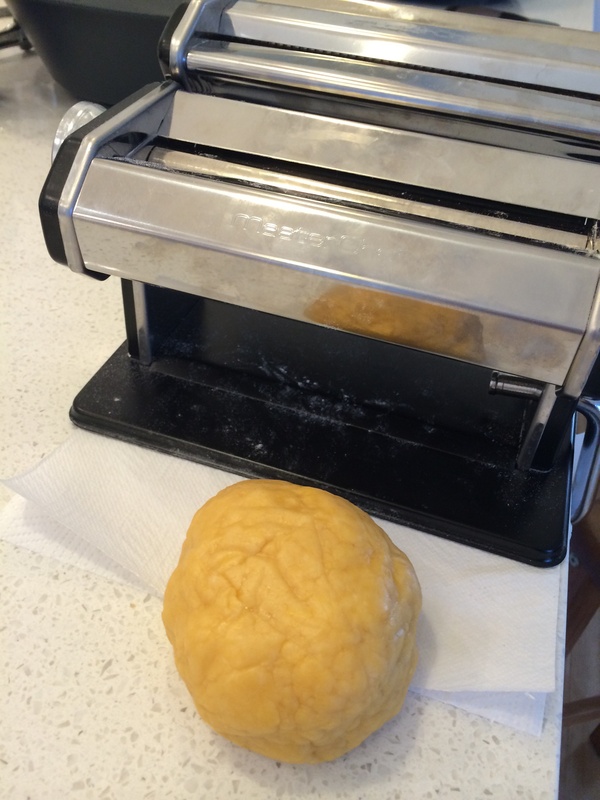 After a couple of very average attempts in the past few days, dough was too sticky and not knowing how to operate the machine properly, the pasta was clumping and difficult to work with. Today I’m hoping for success. Having a teenager with confidence, who’s watched junior masterchef for years, we got it this time. 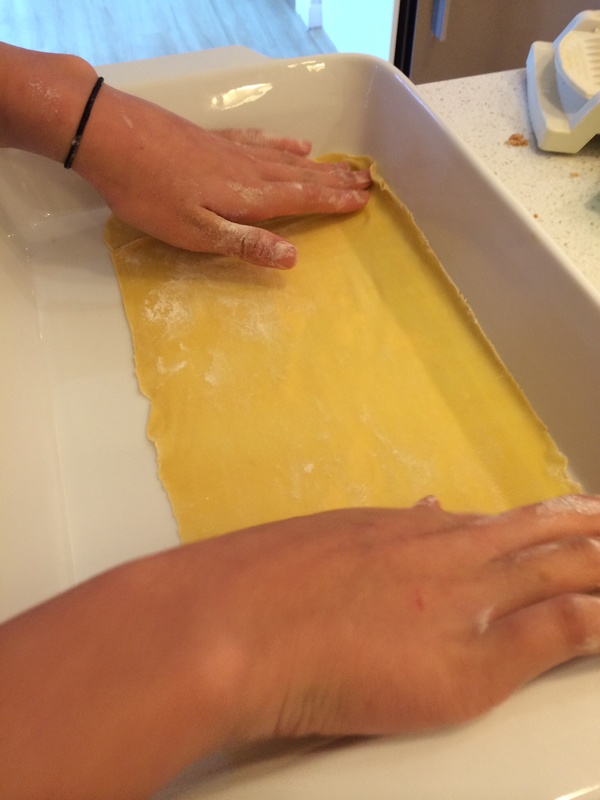 Miss 14 successfully made three pasta sheets. Rested pasta dough for 30mins instead of the 15mins recommended in the guided recipe because many of the experts seemed to quote this being standard and floured the sheets in between rolling. Yippee! Making the sheets turned out to be very simple, and the only change we would make is to 1.5 x the guided recipe for a large sized lasagne dish and not roll out as thinly, number 3 thickness instead of number 2. The homemade pasta was beautiful, paper thin, light and fresh.. To adapt Chelsea’s recipe for thermomix , we cooked bolognese base sauce in TM bowl at the time as steaming chicken and pumpkin in the Varoma above. Added cooked chicken back into sauce then added spinach to wilt. Then made bechemal sauce in TM bowl. Saves time, no pan frying or oven roasting pumpkin and chicken and steaming makes the dish quite light with no extra oil added. 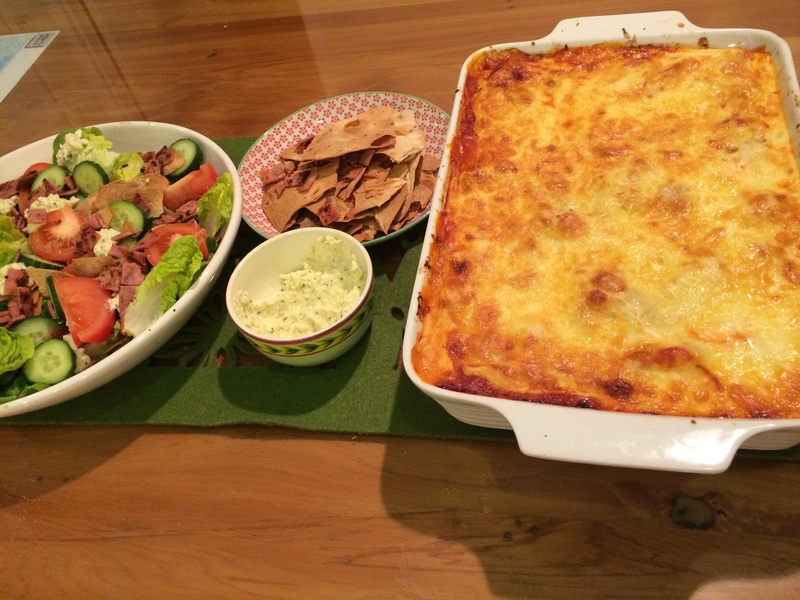 Layered up the lasagne and baked for 35 minutes. Place 4 cloves garlic and one whole onion in TM bowl, Chop 4 sec, speed 7. 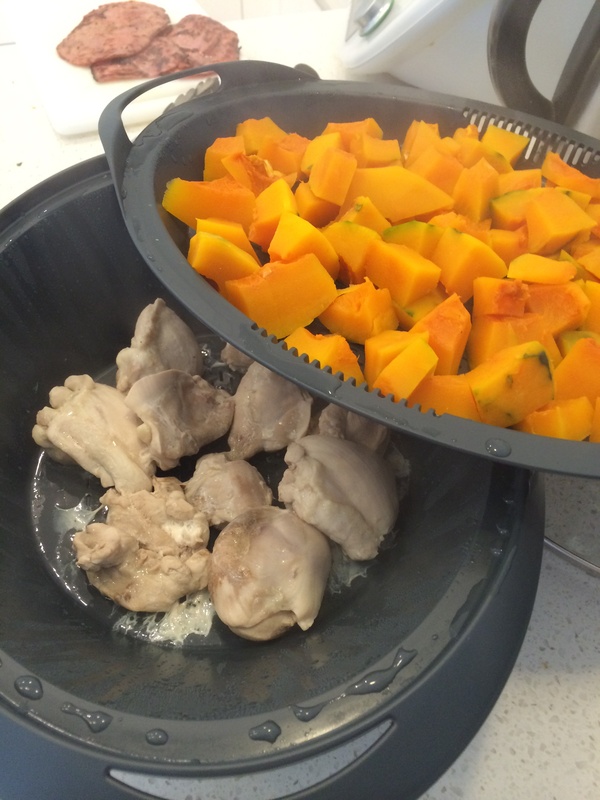 Add 600g peeled and diced 2cm pumpkin pieces to Varoma tray and add 600g chicken thighs halved to varoma dish. Place Varoma dish and tray on top of sauce in TM bowl. Cook bolognese, chicken and pumpkin at same time using TM bowl and Varoma together 25 mins, Varoma temp, speed 1. Remove Varoma after checking pumpkin is soft, mash pumpkin roughly and set aside. Add chicken to TM bowl and shred chicken in the sauce 5 seconds, reverse speed 4. Add 2 cups of spinach leaves to chicken sauce in TM bowl, wilt 5 mins, 100c, reverse speed stir. Set aside. Rinse TM bowl. Make guided bechemal sauce using either the bechemal guided part of the guided lasagne recipe cook all bechemal sauce ingredients 12 mins /100c/ speed 3. (1000g milk , 80g butter, 100g flour, 1 tsp salt, 2 pinches nutmeg )or the separate guided bechemal (500g milk). Depends if you want less or more white sauce. We used 1000g milk this time. Set aside. 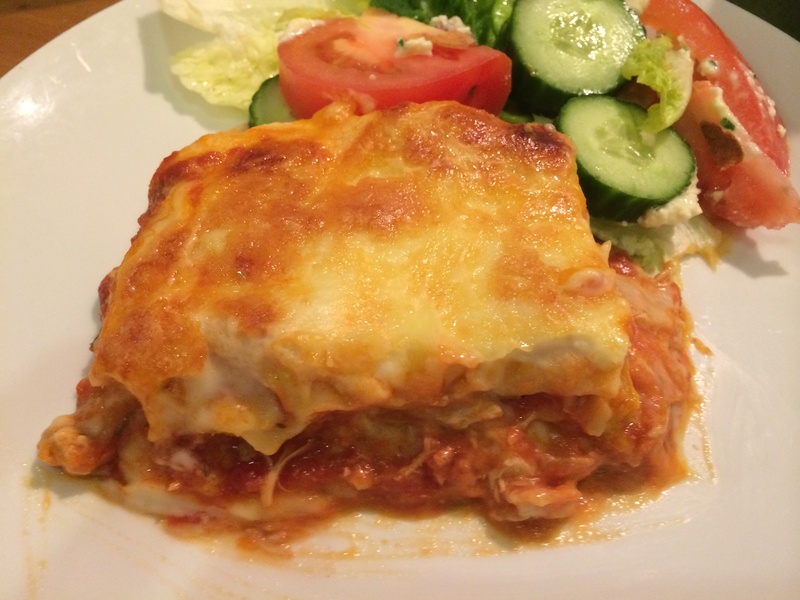 Layer lasagne:- pasta sheet, chicken sauce, bechemal alternately placing the smashed pumpkin in between one of the layers finishing with bechemal on top. Grate a cup of cheese in thermomix and sprinkle over top. Bake 180c for 35 minutes, grill a few minutes to brown top. Rest for 10 minutes to allow it to set before cutting.